A forward contract is a contract whose terms are tailor-made i.e. negotiated between buyer and seller. It is a contract in which two parties trade in the underlying asset at an agreed price at a certain time in future. It is not exactly same as a futures contract, which is a standardized form of the forward contract. A futures contract is an agreement between parties to buy or sell the underlying financial asset at a specified rate and time in future. While a futures contract is traded in an exchange, the forward contract is traded in OTC, i.e. over the counter between two financial institutions or between a financial institution or client. As in both the two types of contract the delivery of the asset takes place at a predetermined time in future, these are commonly misconstrued by the people. But if you dig a bit deeper, you will find that these two contracts differ in many grounds. 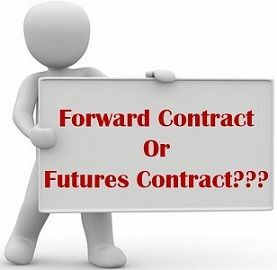 So, here in this article, we are providing you all the necessary differences between forward and futures contract so that you can have a better understanding about these two. Meaning Forward Contract is an agreement between parties to buy and sell the underlying asset at a specified date and agreed rate in future. A contract in which the parties agree to exchange the asset for cash at a fixed price and at a future specified date, is known as future contract. What is it? It is a tailor made contract. It is a standardized contract. Traded on Over the counter, i.e. there is no secondary market. Organized stock exchange. Settlement On maturity date. On a daily basis. Default As they are private agreement, the chances of default are relatively high. No such probability. Collateral Not required Initial margin required. A forward contract is a private agreement between the buyer and seller to exchange the underlying asset for cash at a particular date in the future and at a certain price. On the settlement date, the contract is settled by physical delivery of asset in consideration for cash. Settlement date, quality, quantity, rate and the asset are fixed in the forward contract. Such contracts are traded in a decentralized market, i.e. Over the counter (OTC) where the terms of the contract can be customized as per the needs of the parties concerned. The buyer in a forward contract is considered as long, and his position is assumed as long position while the seller is called short, holds a short position. When the price of the underlying asset rises and is more than the agreed price, the buyer makes a profit. But if the prices fall, and is less than the contracted price the seller makes a profit. A binding contract which is executed at a later date is a future contract. It is an exchange-traded contract of the standardized nature where two parties, decides to exchange an asset, at an agreed price and future specified a date for delivery and payment. A future contract is a standardized in terms of the quantity, date, and delivery of the item. The buyer holds long position while the seller holds a short position in this contract. As the contracts are traded in the official exchange, which acts as both mediator and facilitator between the buyer and seller. The exchange has made it mandatory for both the parties to pay an upfront cost as a margin. Commodity Futures: The contract whose subject matter is commodities such as aluminum, gold, coffee, sugar etc. Financial futures: The contract which deals with financial instruments like treasury bill, currency and so on. An agreement between parties to buy and sell the underlying asset at a certain price on a future date is a forward contract. A future contract is a binding contract whereby the parties agree to buy and sell the asset at a fixed price and a future specified date. The terms of a forward contract are negotiated between buyer and seller. Hence it is customizable. Conversely, a futures contract is a standardized one where the conditions relating to quantity, date, and delivery are standardized. Forward contracts are traded Over the Counter (OTC), i.e. there is no secondary market for such contracts. On the other hand, a Futures contract is traded on an organized securities exchange. When it comes to settlement, forward contracts settle on a maturity date. As compared to the future contract which is marked to market on a daily basis, i.e. the profit or losses are settled daily. There is a high counterparty risk in case of forward contract as compared to a futures contract. In the case of a forward contract, there are high chances of default by a party, as the agreement is private in nature. Unlike a future contract, where clearing houses are involved, that guarantees the transaction, so the possibility of default is almost nil. If we talk about the size of the contract, in a forward contract, it depends on the terms of the contract, whereas the size is fixed in case of the futures contract. The maturity of the contract is as per the contractual terms in the forward contract while the same is predetermined in the futures contract. In forward contracts, there is no requirement of collateral, but in futures contracts, initial margin is required. Forward contracts are self-regulated. Unlike futures contracts, which are regulated by the securities exchange. As per the above discussion, it can be said that there are several dissimilarities between these two contracts. The credit risk in a forward contract is relatively higher that in a futures contract. Forward contracts can be used for both hedging and speculation, but as the contract is tailor made, it is best for hedging. Conversely, futures contracts are appropriate for speculation.